Miss the part about how we got here? Read about how the Alcan ate our trailer, and watch the first video! 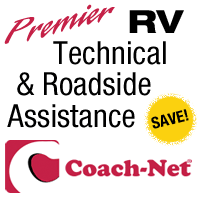 CoachNet saves the day by dispatching roadside assistance! Jason from Capital Towing, was the friendliest, most helpful tow truck driver I have ever dealt with. Canadians are just that way eh. 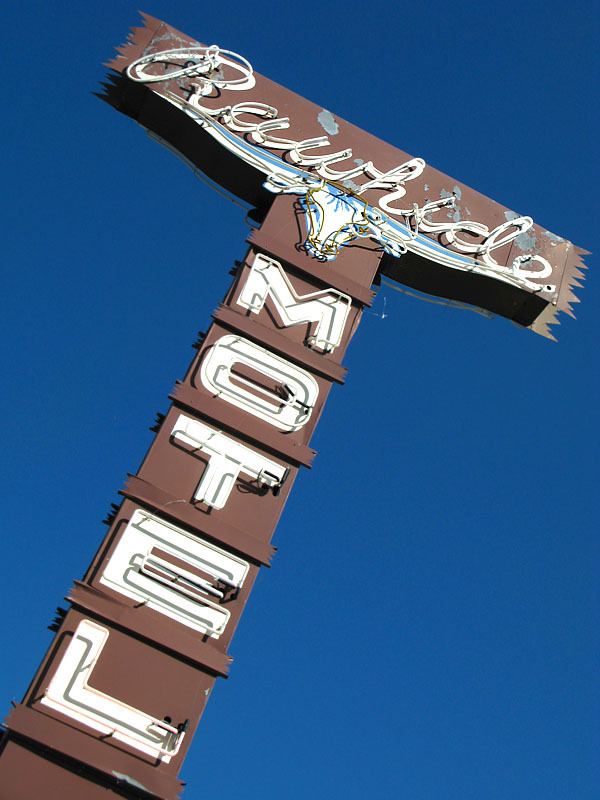 CoachNet deserves another shout-out for sending them to the rescue out in the middle of nowhere–literally. It was a 5+ hour drive back to Whitehorse from the spot where our leaf spring broke in the middle of nowhere. Giving thanks for roadside assistance. After profusely apologizing for keeping him waiting, we discovered none of our worst fears had become reality. Nobody had broken in. The rig had not burned down. It was still intact, and upright. Next came the challenge of getting our trailer onto his. 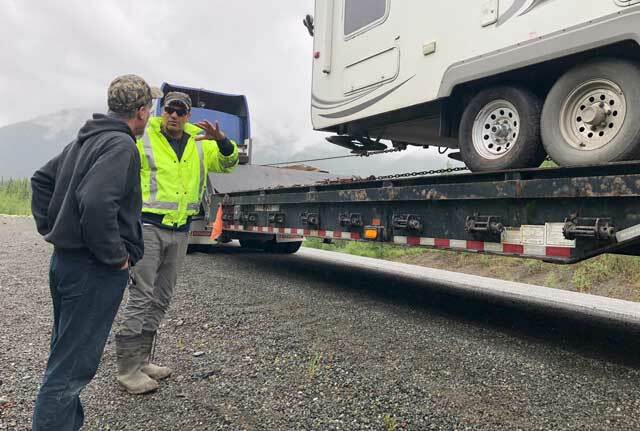 “Usually these things are on their side.” Grinning at his comment, I looked at the steep gravel shoulder, and gave thanks for our Tire Pressure Monitoring System which quickly alerted us to the issue. 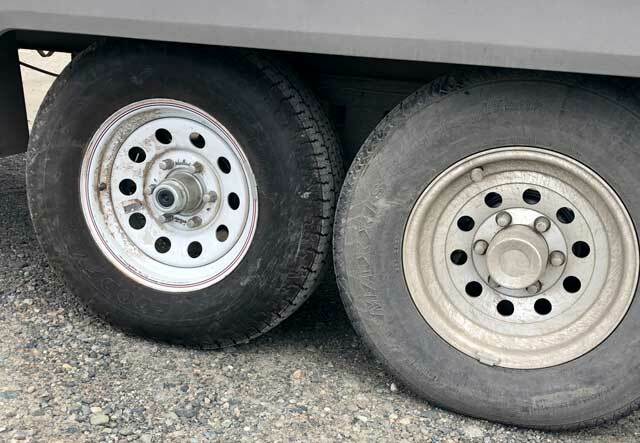 Had I not immediately pulled over after hearing the TPMS beep, we could have broken another spring and left our axle behind, causing much more serious damage to our trailer, our truck, or even ourselves. Backing trailer on to low-boy hauler. 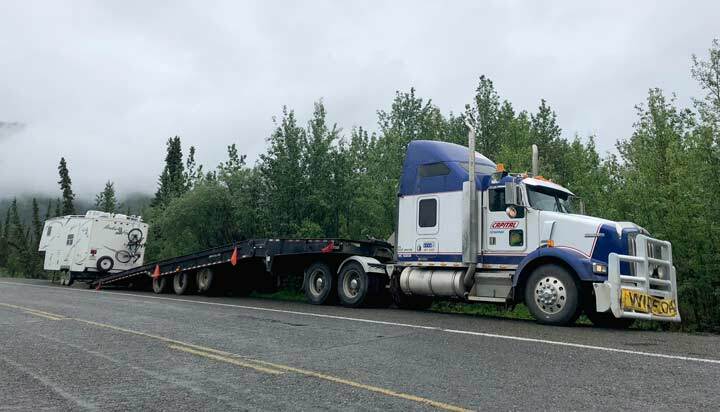 Backing our home up onto that low-boy hauler on the side of the highway–with a broken leaf spring–was some of the most exciting maneuvering I’d done since logging the Upper Ranch while workamping at Vickers. Then came the long drive back. It was heartbreaking to see our home sitting on a trailer in the highway in front front of us. 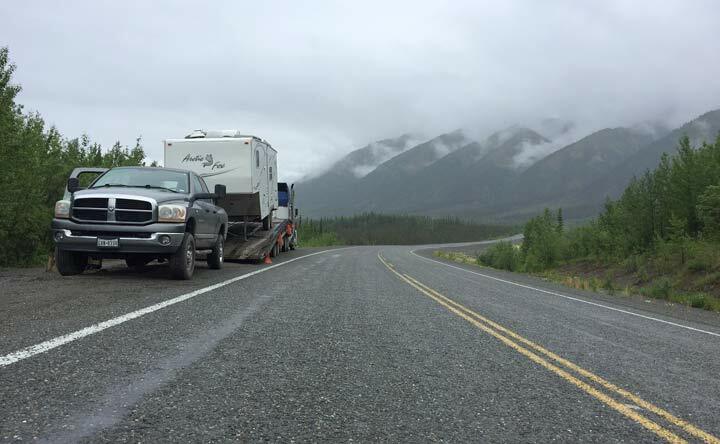 Trailer towing our home back south on Alaska Highway. 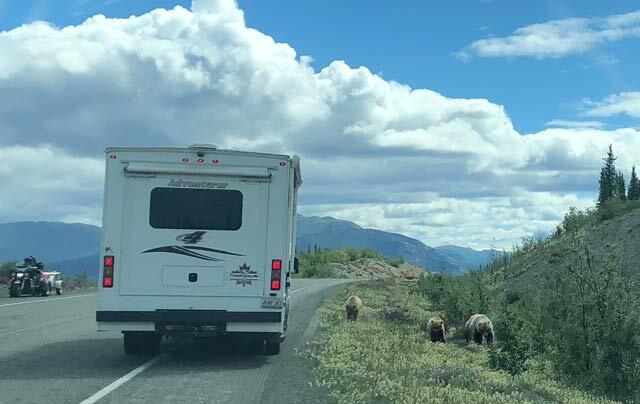 Rene will have to tell you more about the Grizzly Bear momma and her cubs who we saw right out her window on our way back to Whitehorse, after passing our home on the highway. One of the good things that came of this whole ordeal…the Yukon spirits were certainly working in our favor. Getting off that trailer was almost as much fun as backing up onto it. Loading trailer off low-boy hauler. All went about as good as could be expected, or better. Until we realized our rear trailer tire wouldn’t roll. Well, it did, just in the wrong directions since it was rubbing on the front one. Free camping behind Tamarack welding! Did we mention this was Canada Day? At least we got free camping for the long weekend–with electric–over the three days we waited for the shop to open. Dreading the expense and long wait we were expecting the whole time. “This isn’t as bad as we thought.” Those rank up there with the best words I’ve ever heard. After our ordeal, I needed to hear that. All the folks at Tamarack Welding & The Spring Shop were friendly and helpful, they even dropped by to check on us over the holiday weekend before they opened on Tuesday. 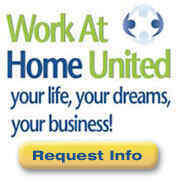 Many thanks again to CoachNet for finding the right people for the right job! 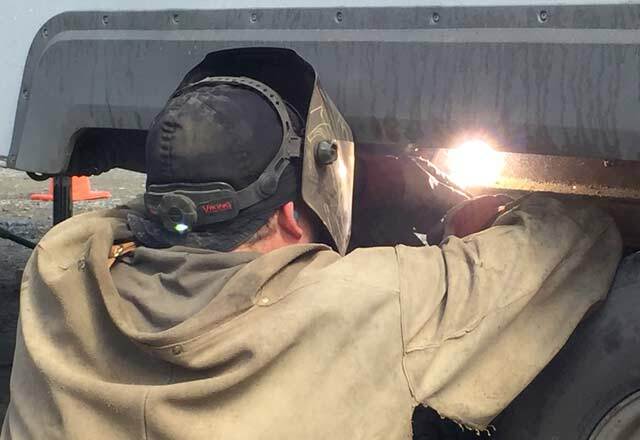 Tamarack Welding and Spring Repair gets the job done right. 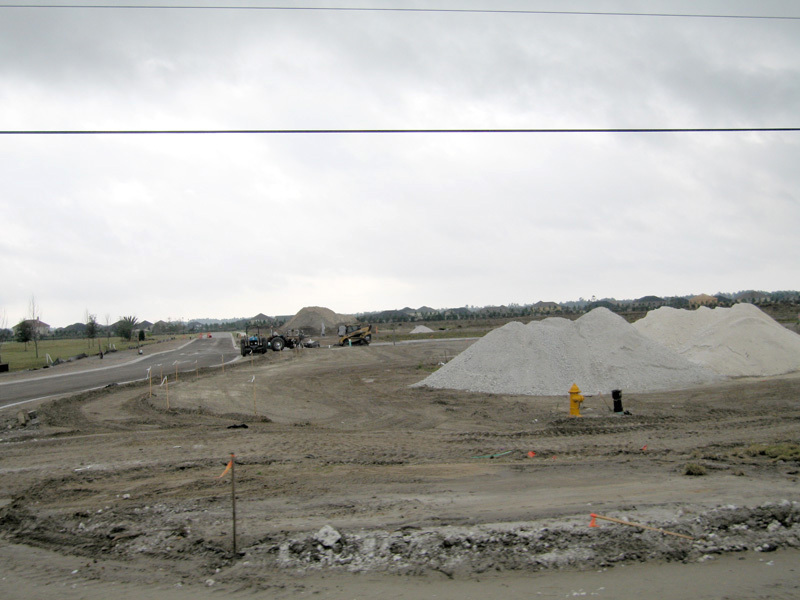 They got it done quick, and at an affordable price–much less expensive that we expected. What did we have done? 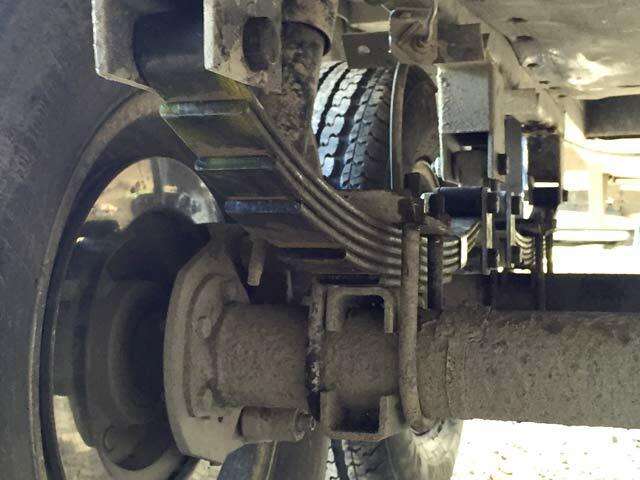 We basically had Tamarack rebuild our entire trailer suspension. One spring set was broken, and two shock absorber mounts had sheared off. We replaced all the (4-leaf) springs we had with new 6-leaf spring sets. The guys at Tamarack even reinforced the shock absorber mounts, since the welding job done during manufacturing was clearly not up to par. Recreational Vehicle trailer suspensions are built to the absolute minimum specification–and that is to the vehicle dry weight! We had prepared the best we could for this trip. We serviced our truck. We had all new tires. But in all the research we did, we read nothing about the lacking stock suspension in the vast majority of travel trailers. 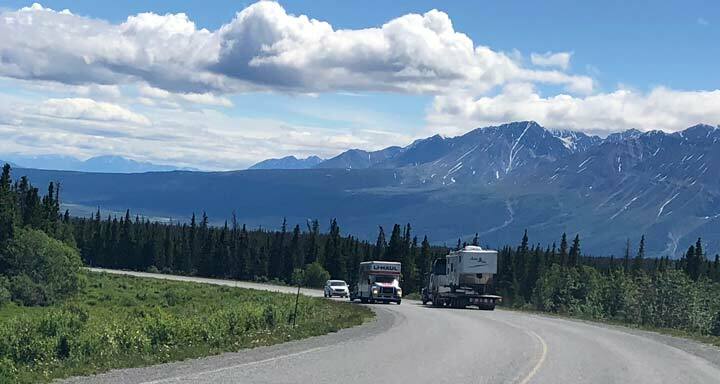 If you’re planning a similar journey, and do one thing to prepare for a trip along the Alaska Highway, reconsider your suspension! 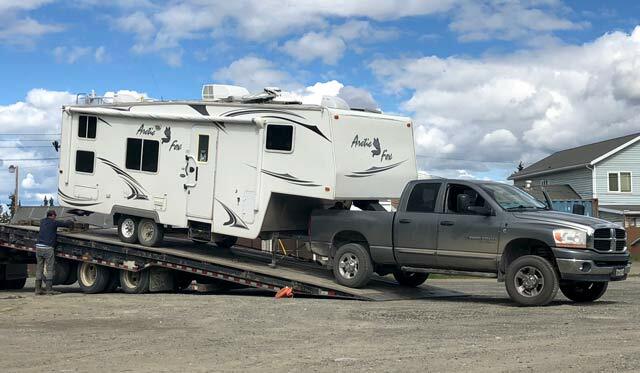 If you travel in a trailer, and it is more than five years old, stop at Tamarack in Whitehorse and upgrade the springs before you head north of Destruction Bay! You may prevent some serious destruction. We also learned the value of our TPMS, and how important it is to have the best RV roadside assistance. Did I mention that we also have the CoachNet tire coverage? Getting a free replacement tire, with no questions asked was another thing that made this whole ordeal, just that much easier! Another important lesson for other full-time travelers: Roadside assistance is a must! CoachNet buys us a new tire! 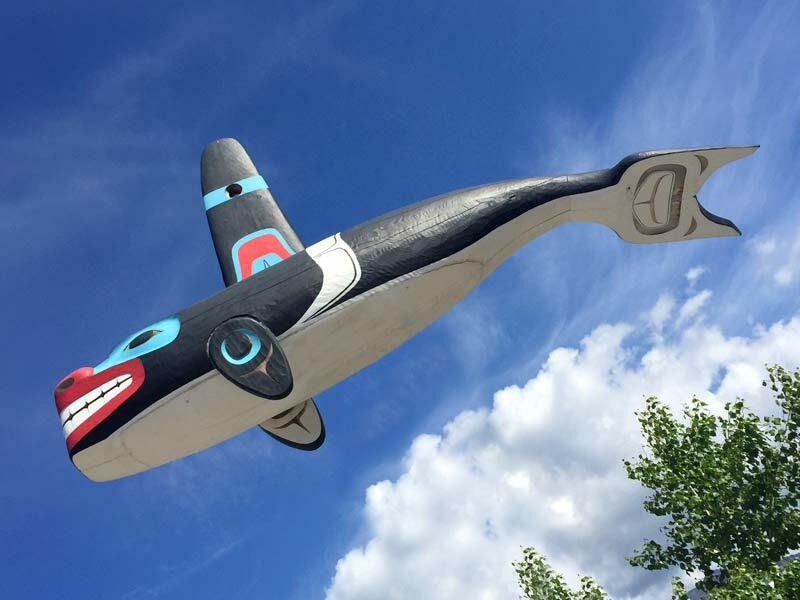 And, we discovered the importance of being grateful for those who help you along the way…including those Yukon spirits that helped save the day. Good that it finally worked out for you guys. 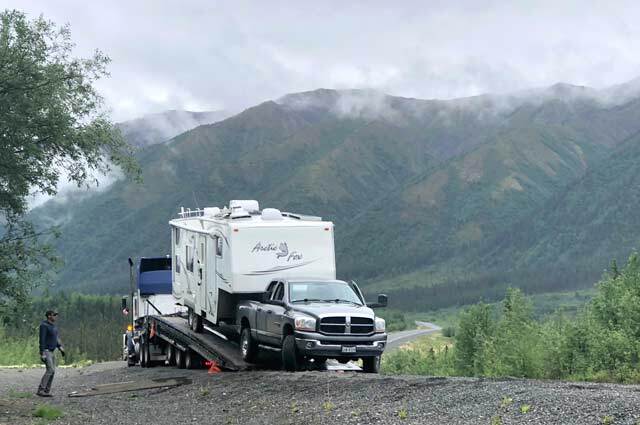 We’ve gone back and forth a few times with an enclosed 10k trailer, hauling our household up to the Mat-Su Valley from California. So far it’s been five shackle hangers, three bolts, one backing plate, a brake magnet gone. 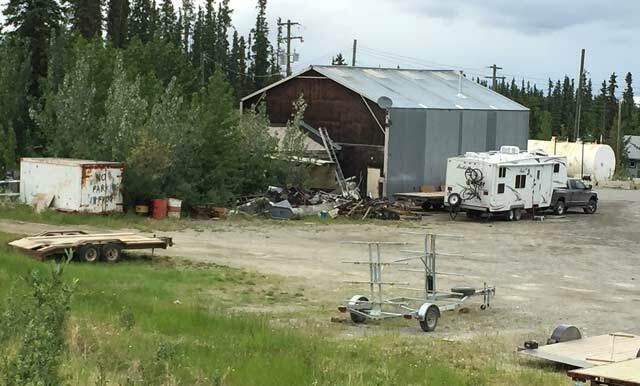 We found a terrific trailer supply place in Dawson Creek, behind the Canadian Tire store. I did a field fix at a roadside area about sixty miles from Whitehorse – filed down a couple of receiver hitch pins, drilled them out for safety wire, and used them as shackle bolts, along with a few hex keys and lots more safety wire. Had to stop twice more to reset the repair, but finally made it to DC, and got all the repair parts at the supply place. Now we’re back down in Southern California, and it’s time for me to do some welding and parts replacement, lol. 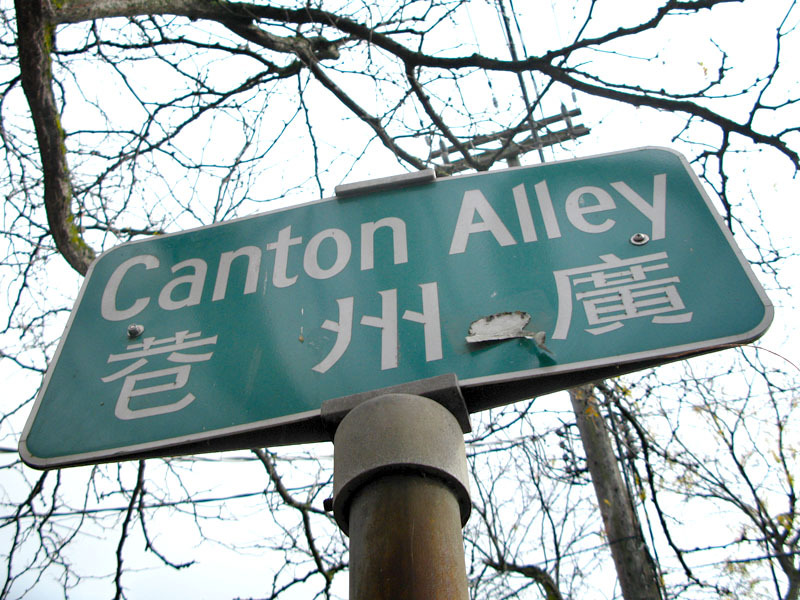 That road is a fun ride, eh? Wow you are becoming quite the expert Greg! Kudos to you, Mr. McGyver. And congrats on getting out of SoCal! Hope you love it up there. Thanks for reading. I couple weeks ago I was under my Rockwood 5th wheel, replacing a fresh water drain part. That was when i noticed almost imperceptible cracks where the axles connect to the frame. Looks like it will be a simple welding job to prevent any further deterioration, before I head south this winter. So glad I found the problem now before it became more serious. And this was BEFORE I read your story! Glad it wasn’t more serious. Nice catch! Good luck with that. so much for the broken stuff & the causes, good to hear you are safe & sound and back on the road again! Enjoy Alaska, a fabulous place! BTW the lady at the small cafe at Desolation Bay serves a great cup of coffee. And, the boon-docking in that area was nice & quiet. 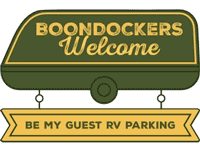 Thanks again…our boondocking spot at Burwash Landing was one of our best yet on this journey! 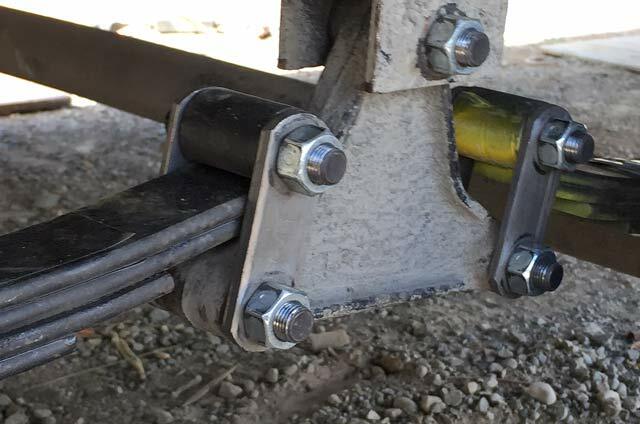 I hate to be the one to say this, but I would bet money that the now 6 leaf springs will cause the problem to move to the next weakest link in the chain. Also, the 6 springs will provide less “give” and transfer more shock into the frame & trailer. Have you weighed the trailer recently, fully loaded, with max fluids in the tanks? Is the load within ALL ratings on the trailer, tires, and truck rear axle. Is the load within limits on each individual wheel and tire (side-to-side & front-to-back)? (ie, weigh under each tire separately, like the “Life on Wheels” folks used to do. 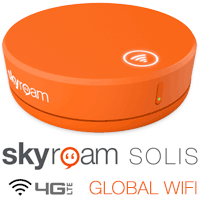 BTW, the last Alask, trip, 2017, I learned that Good Sam’s, who I’ve been loyal to for years, will drop coverage without telling you, while you’re still out there, if you “exceed our limits of profitability within the year”. Their representative actually told me I “should read the fine print buried in the contract”! So, tow insurance is good only to a certain point. 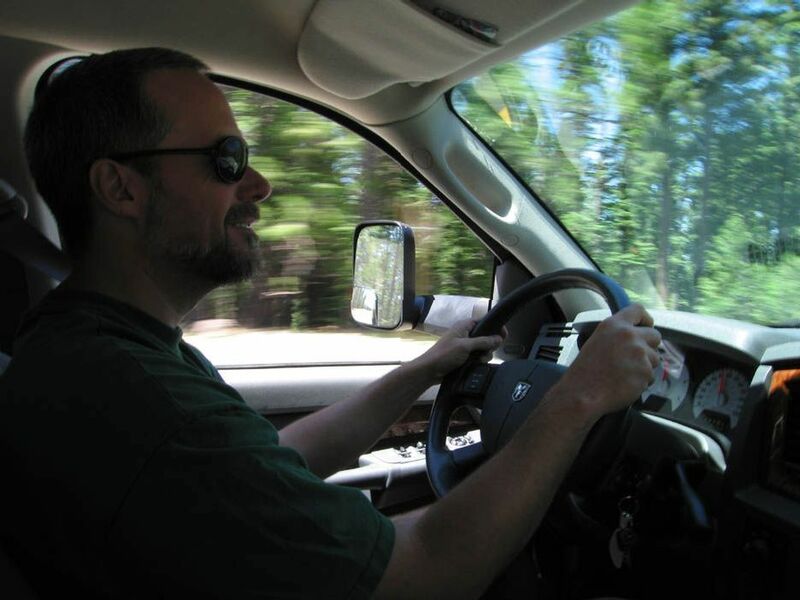 My last tow, to Auburn, CA from Fuller Lake, was on me – 450 bucks. 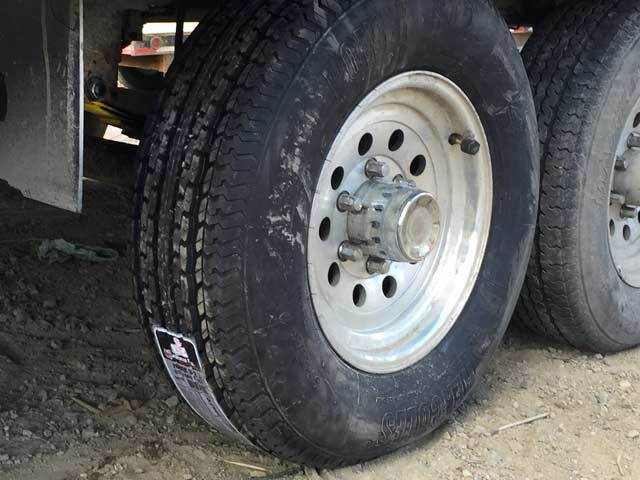 Yikes…and yes, we’ve been weighed, fully loaded, with certified individual wheel weights by SmartWeigh, a couple times. We are well below our maximum weight ratings for GVW and GCVW. These springs were bound to break, just glad the damage wasn’t any worse than it was–it sure coulda been! Yay! I’m glad for a happy ending for you. Safe travels the rest of the way! I learned alot from your “adventure” It is good to know that even in the remotes of the US you can find help with every situation. Very good to know. Especially when you arrive at the nearest town with a capable tow truck and shop…only to discover they are closed for the week! 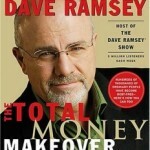 Great information Jim and glad to hear it.all worked out! We plan on taking that journey in a couple years so we will certainly be taking a good look at our suspension prior to heading out. Safe travels the rest of the way! 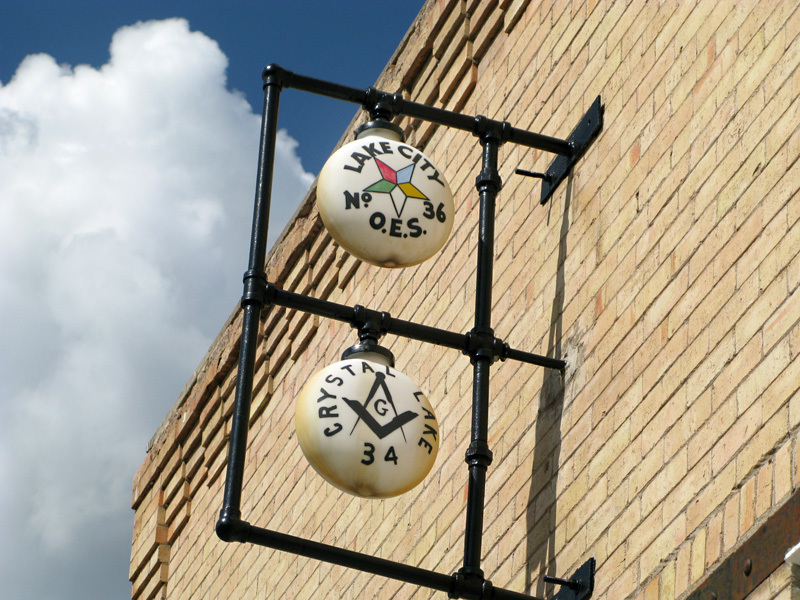 Thanks for reading, and happy travels! This journey has certainly been worth it, and we won’t let these setbacks ruin the trip…maybe just change our course a bit. VERY informative….and good to hear about CoachNet…we’re members ourselves and though we hope to never HAVE to use them…lol….it’s always great to hear good reviews. How blessed indeed to find GOOD help!!! Can’t wait for the “next” installment! Thanks for reading Margie. We’ve had nothing but great support from CoachNet, and the tire coverage has been well worth it! I only hope our next installment doesn’t involve calling them again. Hey Jim, great reporting with excellent photos. How long did the entire process take? 20-30 years ago my folks were pulling a 5er in the south when they busted a spring. They asked him if he wanted to replace both sets and my Dad, being the cheap old fart that he was, said “NO.” They went on their way. Next day, guess what happened? Lesson learned. Don’t be a cheap old fart. Thanks Roger! The spring broke south of Beaver Creek at about 9:00 a.m. Friday morning. We left the shop in Whitehorse Tuesday afternoon, only because they were closed for the long Canada Day weekend. The actual repair required 4 hours of shop labor. I had every intention of replacing, and upgrading all the springs, and Chris at Tamarack confirmed that was a good idea after taking one look at the other side.